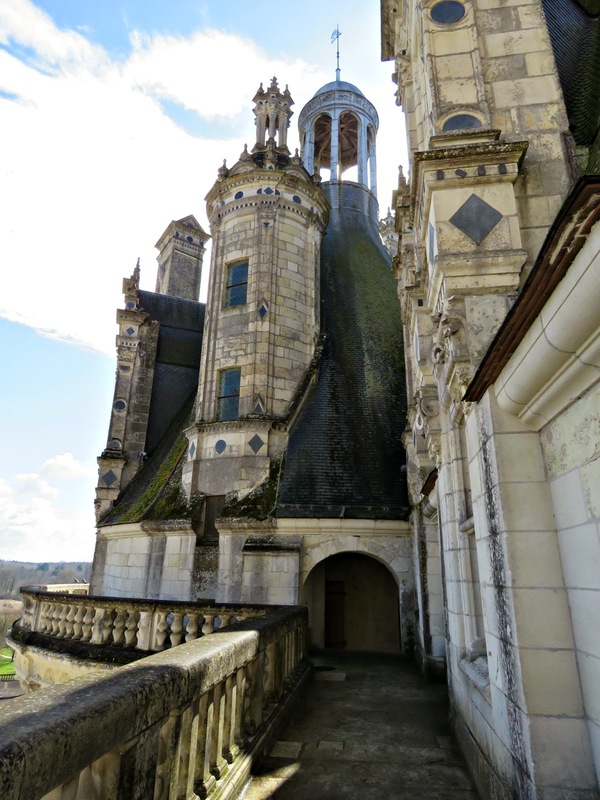 The other day, as we were bombing down the Loire Valley, we came upon a castle that blew us away. 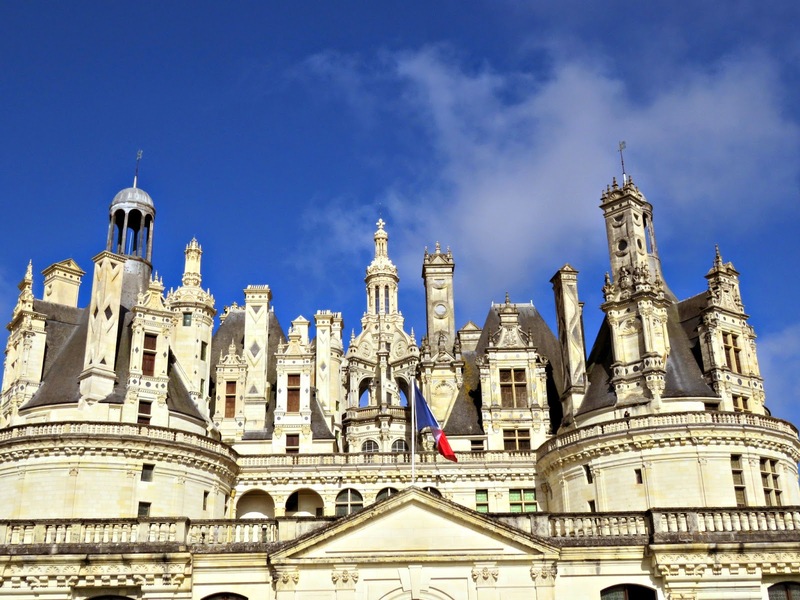 Feast your eyes on the Renaissance splendour that is the Château de Chambord. Some say it was the brain child of no less a genius than Leonardo Da Vinci. 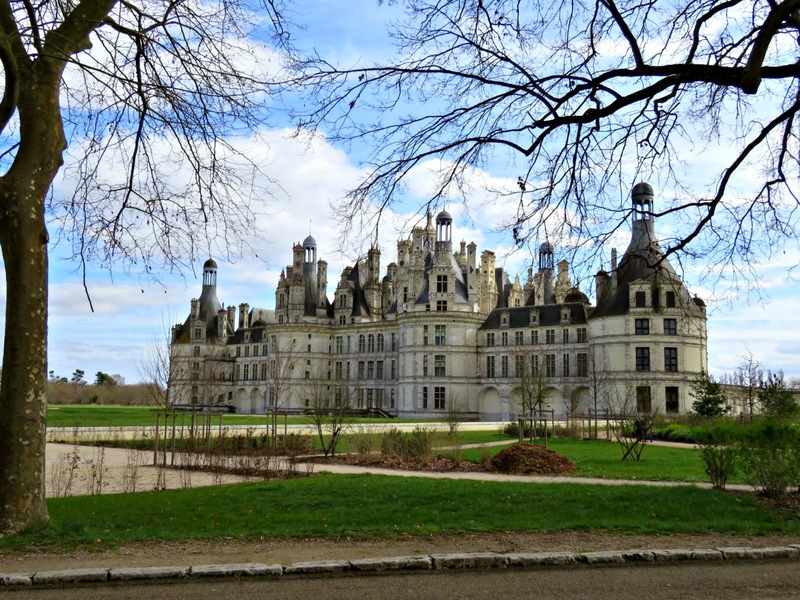 Old Leo swung by the Loire before Francis I got to work on his great fantasy castle, and there's a complicated geometry to this place that has his fingerprints all over it. He also brought along a little portrait that he'd knocked off before he left home. It was something that he'd been obsessing over on and off, fiddling with and repainting from time to time as the whim took him. 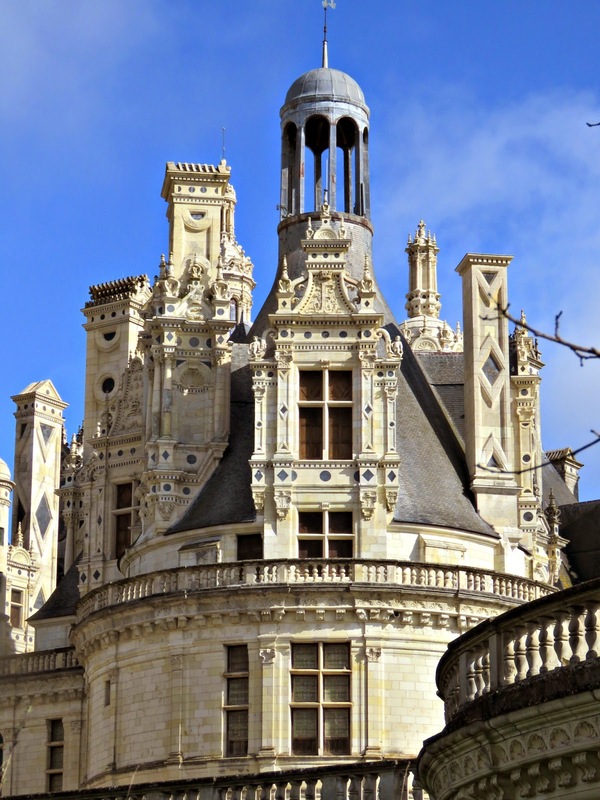 In the course of time Francis purchased the painting and it went to live with him in his castle at Fontainebleau. We know it today as the Mona Lisa. Francis I was a bit of a boy-wonder King. He took the throne in 1515 at the tender age of twenty, and immediately set about reconquering the province of Milan, French territory that had been lost by his predecessor Louis XII. 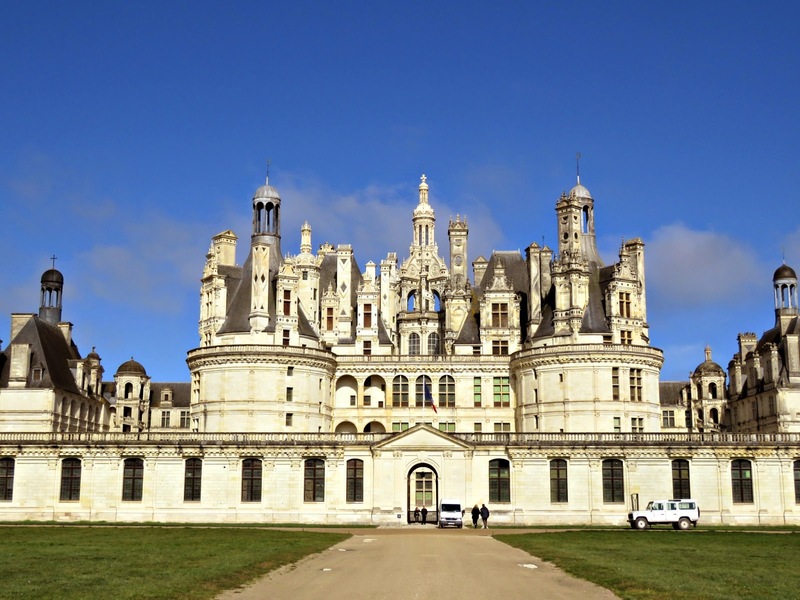 Buoyed up by victory, and heavily influenced by the wonders of the Italian Renaissance, Francis returned home and started work on his great castle at Chambord in 1519. In many ways it borrows heavily from the classical footprint of a medieval castle: there's a central keep flanked by four tall towers, two wings and a curtain wall, but none of them are designed for defensive strength. 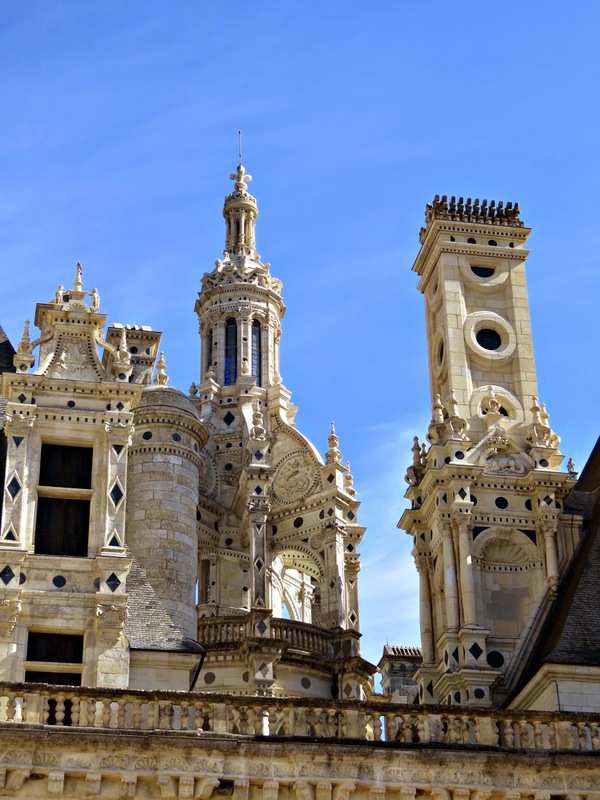 Perhaps, for the sake of tradition, they follow the outline of a great feudal stronghold, but they've been prettified and titivated for purely aesthetic reasons and then built to make a statement about the King's wealth and power. 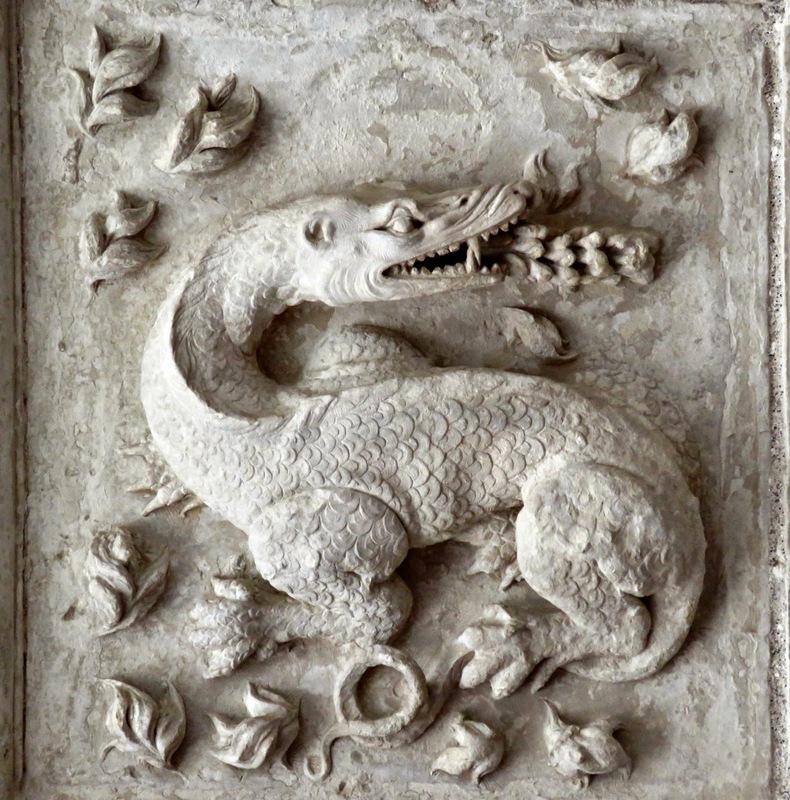 Francis was passionate about hunting and architecture. 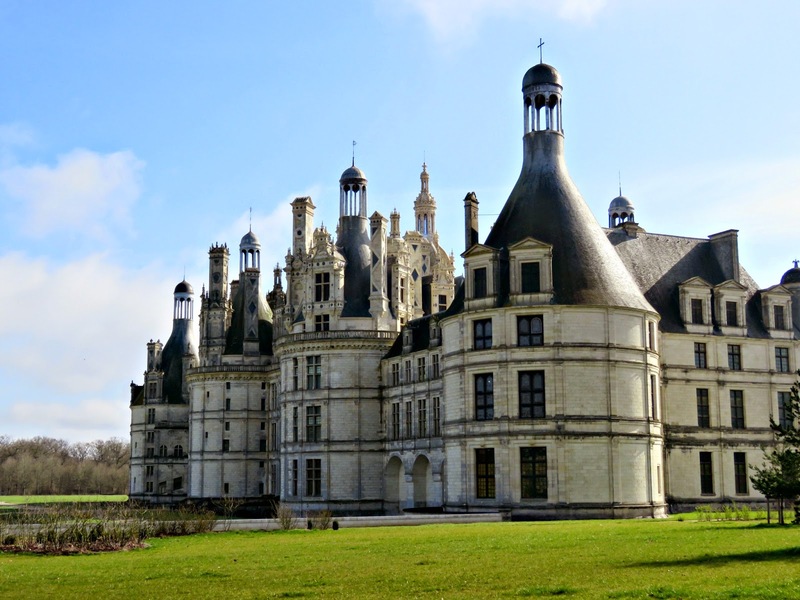 Chambord, originally conceived as a royal hunting lodge, represented the union of his two great passions. As time went by, things got seriously out of hand, and it morphed into an extravagant château with 77 staircases, 282 fireplaces and 426 rooms. Not bad for a little place in the woods. Francis was into one man upmanship in a big way. He'd wanted to be the Holy Roman Emperor, but his arch rival, Charles V, beat him to it, and seized the prize. A fierce personal rivalry ensued, which was played out in their territorial campaigns as they battled over much of northern Italy. 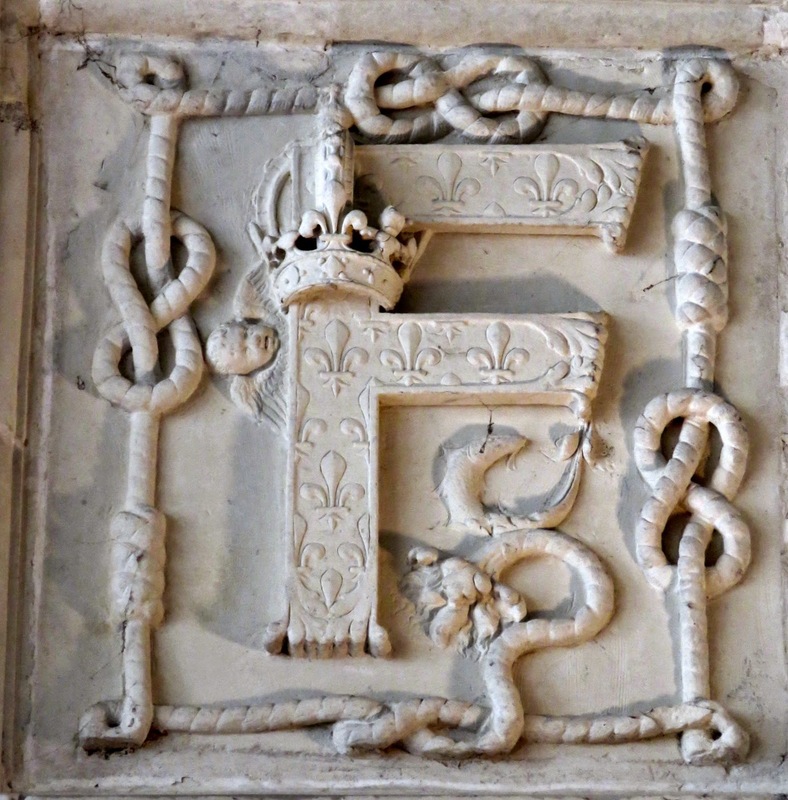 Francis sought to rope in Henry VIII of England as an ally. To which end the two kings met at the Field of the Cloth of Gold in June 1520, when they tried to out-shine one another in their splendour and refinement. And, whilst Henry was happy to strut his stuff in a field near Calais, he kept his armies safely back at home in England. Even on his quiet days, when he wasn't meeting rival monarchs, Francis was a bit blingtastic. 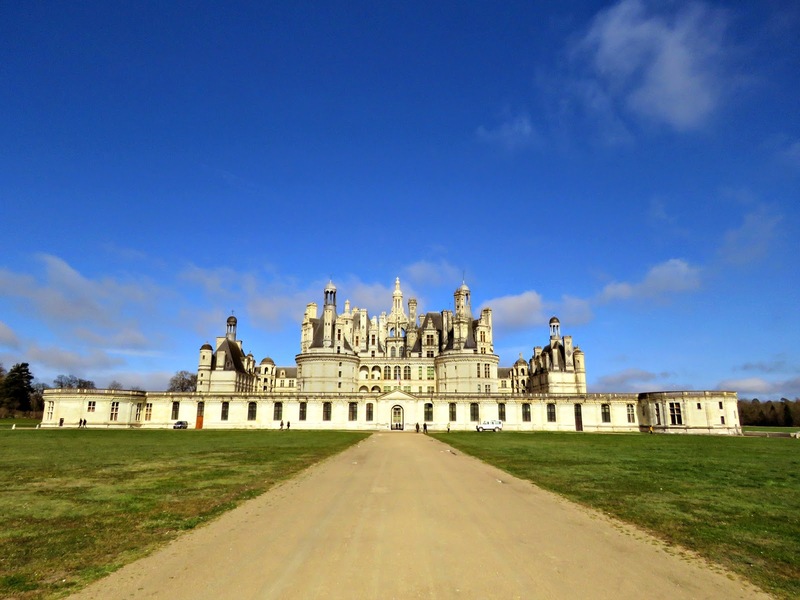 And that's really what was behind the concept and design of Chambord. It was conceived to knock the socks off his old rival, Charles V, who was, of course, invited over to pop a few wild boar once it had advanced to a level at which Charles was guaranteed a right royal eyeful. History recalls that Charles had the good grace and the honesty of spirit to admit to his host that he was suitably impressed. Anyway that's all by way of background. Back to the castle: it's one of the most amazing places I've ever visited. There's a whole complex geometry to the central design of the keep, all based around a Greek Cross. 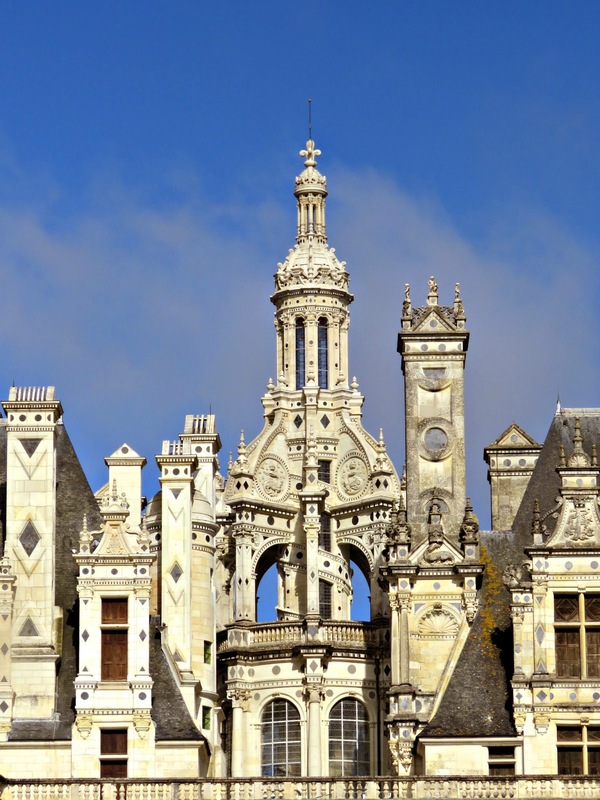 But for me it was a castle of staircases: great feats of masonry ascending and descending in all directions like a series of elaborate stage sets on which to see and to be seen. 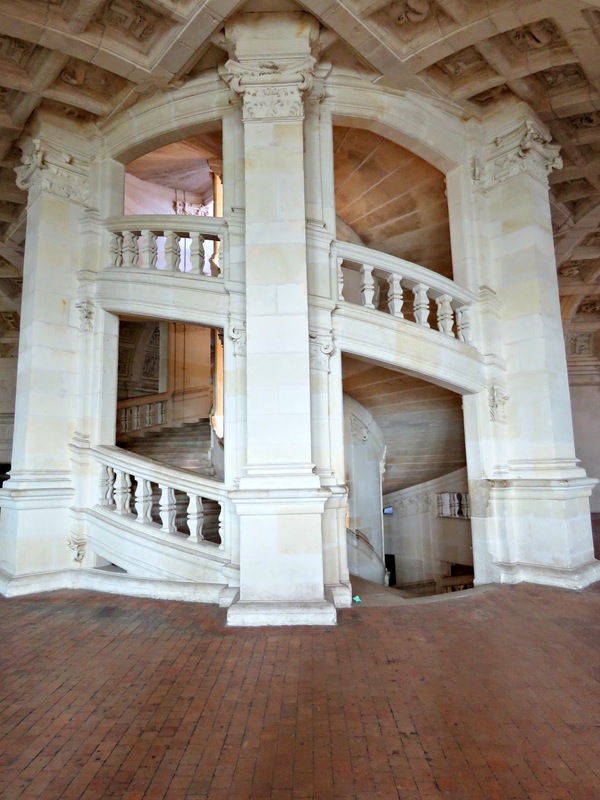 The amazing central staircase of the keep is like a double helix. There are two flights of stairs unwinding in concentric circles from the same central newel, which is hollow with ornamental apertures. One person can ascend while another descends without their meeting, although they can see one another through the apertures. It's pure theatre. I can so easily imagine Francis I leading a very envious Charles V up those grand stone stairs, gloating all the while over how well he'd out-shone anything his rival could call home. 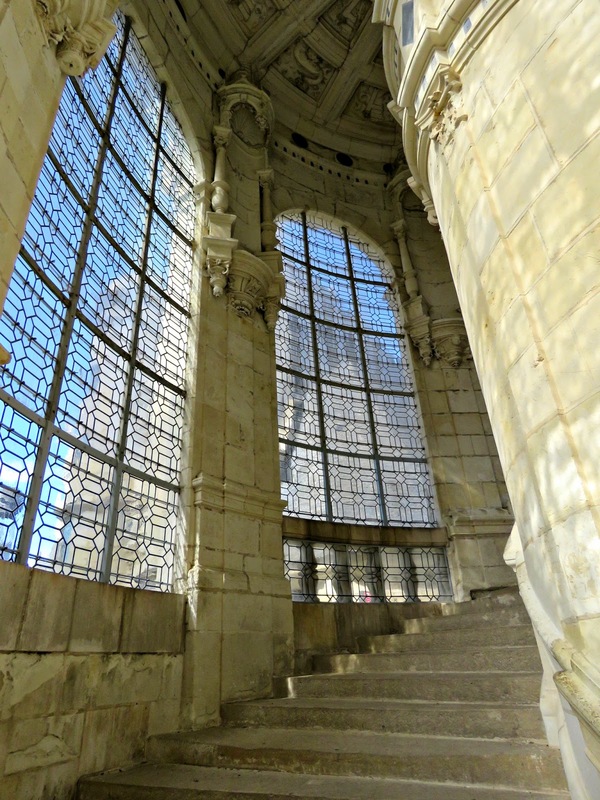 Even though the staircase is at the centre of a huge building it's illuminated by natural light from the glass lantern at the top. And, of course, it's not the only stair case on which you can shake a tail feather. There are at least another 76 to run up and down if you've got the energy. And they all lead up to the wonderful terraces on top. 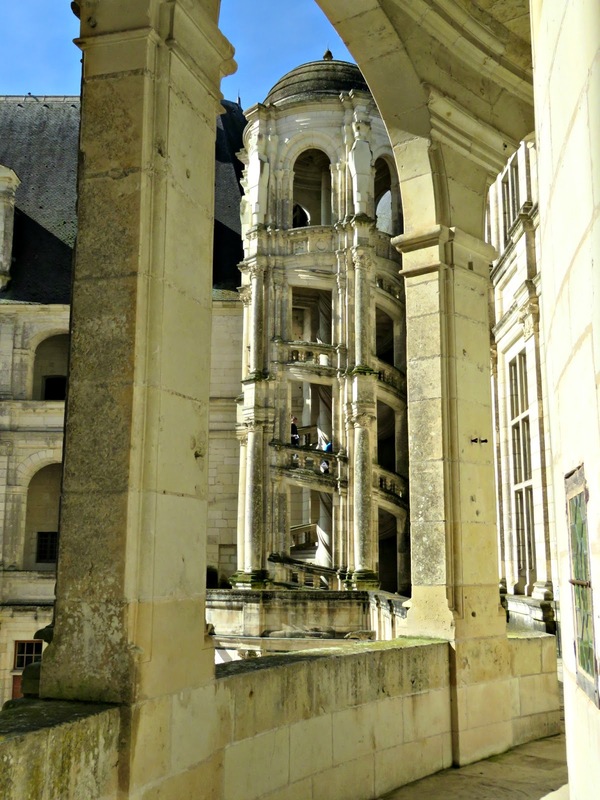 There are so many towers, pillars, loggias, pilasters, carvings of salamanders, cherubs and fleurs-de-lys up there on the Renaissance Terraces. It's amazing how the master stonemasons were able to sculpt the tufa, the local sandstone, like icing on a cake. Francis I intended it to look like the skyline of Constantinople, and for my money it looks like something out of a fairytale. 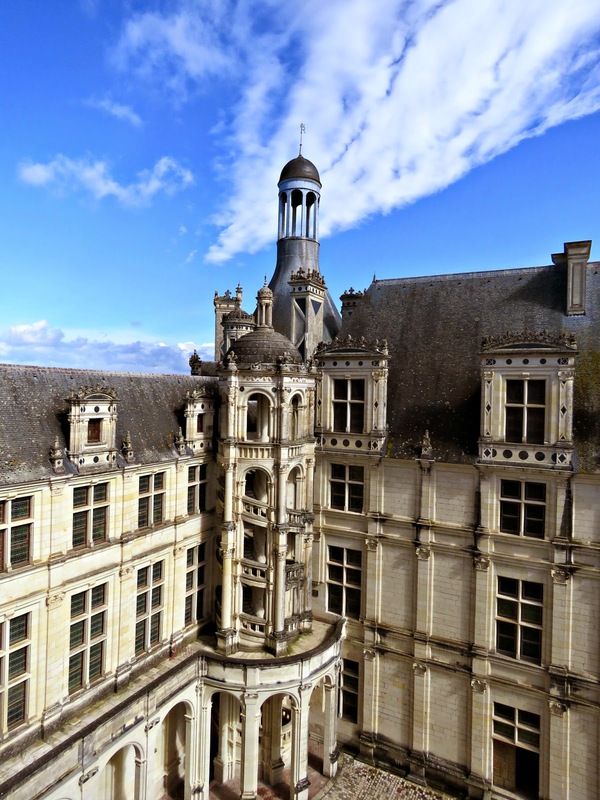 It's an amazing cityscape sprouting out of the main roof to the Château, to leave you wondering whether you're in the tranquil idyll of the Loire Valley or some heavenly metropolis designed by angels. Back in the day, when the Great Lords went hunting in the woods round about, the chatter and laughter of the ladies of the court rang out around these terraces. They'd come up here to entertain themselves watching the hunting parties return. And if you stand quietly in a shady corner you can still almost hear the distant echo of their dainty shoes dancing over the tiles, and the polite clink of their glassware as they took refreshments and waited for their menfolk to come home. For me these terraces were the very best bit of the whole castle. On a sunny spring morning, framed by a brilliant blue sky, they were a surreal dreamscape. In the great rooms downstairs they've got lots of furniture and paintings from other eras. But back in the days of Francis I the castle was mostly kept empty. 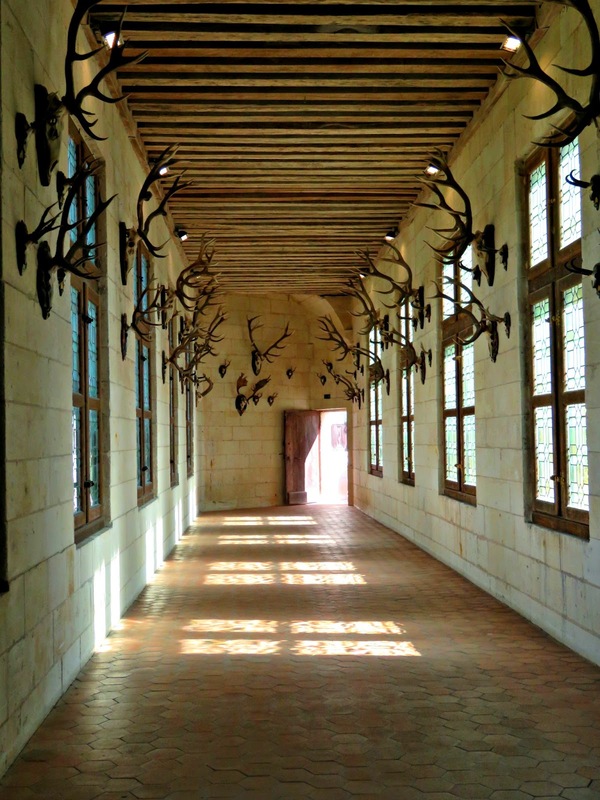 When the King came to his hunting lodge a cavalcade of carts and carriages would roll in ahead of him, laden down with furniture and wall hangings to turn the cold, unadorned rooms of the castle into a residence fit for a great prince. Then, when he'd done with shooting his wild boar and hunting his stag, they'd pack everything up and move on. 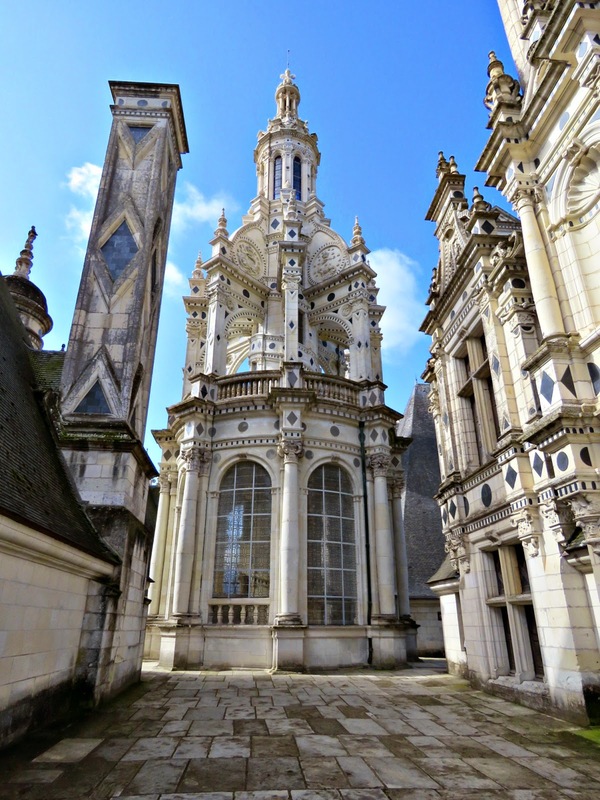 And Chambord would go back to being a large, deserted folly sitting quietly and splendidly amidst the trees. For me the magic of its spell was woven strongest when it was allied with the history of Francis I and the guiding genius of the great Da Vinci. Other princes and kings came afterwards but none surpassed the heady romance and exuberant vision of those early days. Oh, and I must add that each and everyone of your shots are much prettier than the postcards that were on sale at the castle! :D Bravissima! Oh wow - that's so beautiful! I love it! You've caught some wonderful shots from great perspectives. WOW! This post is a real treat Bonny! You photographed the castle beautifully. But what I like best about this post is the way you described the castle and explained its history. Thank for the virtual tour --wow, lots of information, too! That castle is amazing. I agree with your friends above - your photos are postcard worthy and your tour services are extraordinary. I feel as though I've been transported to the castle and I have my very own personal guide and story teller to lead the way. 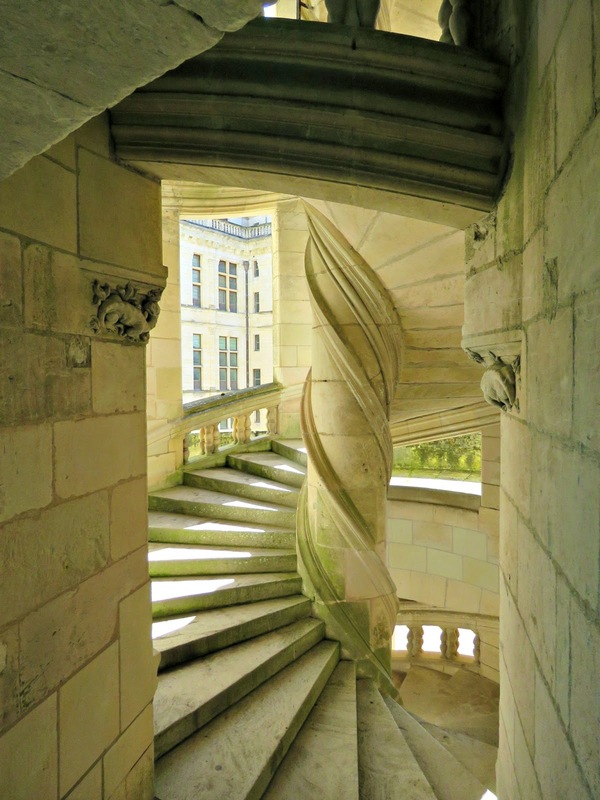 The stairs and the terraces are the features I adore - and doesn't every girl dream of living in her own castle? Thank you Bonny for bringing adventure to my life! If I don't make it back here before Sunday: have a blessed Easter, Bonny!